10. The Athenian democracy is the eldest form of democracy in the world. At each political gathering held in Ancient Athens there were at least 6,000 citizens present. So it is that they would usually meet on the slopes of a hill and cast their vote by raising their hands. 9. Sometimes, after a victory in a battle, the Ancient Greek soldiers offered their armours as a token of gratitude to the gods. They used to leave their armours in temples or hang them on the branches of the trees. 8. The Spartan warriors were reputed for their long hair. Prior to the start of a battle they used to sit down and comb their hair. Additionally, bravery was hailed as the most significant human value by the Spartans. The cowards were usually punished by cutting half of their capillary hair as well as half of their beard so that other people would recognize their treachery. 7. The vast majority of the Ancient Greek boats had a big eye painted on a part of the prow. The sailors hoped that these piercing eyes would keep the bad spirits away and protect them from bad luck. 6. Many Ancient Greeks prayed to the gods at home, in front of some special shrines. They used to offer the gods wine and foods. Sometimes, those who prayed would pour on the shrine all the wine from the jar, but in most of the cases they would drink up the whole wine, leaving only a drop for the gods. 5. The Ancient Greek sculptors built astonishing statues. A legend claims that a certain Pygmalion sculpted a statue of a woman who seemed to have been alive and eventually fell in love with her. After hearing this, Afrodita, the goddess of love, got touched and brought the statue to life. 4. The modern marathons are inspired by the distance ran by the poor Philippides 2,500 years ago when he announced the victory at the Battle of Marathon. After he had announced the great news, Philippides dropped dead because of the tremendous physical effort. 3. 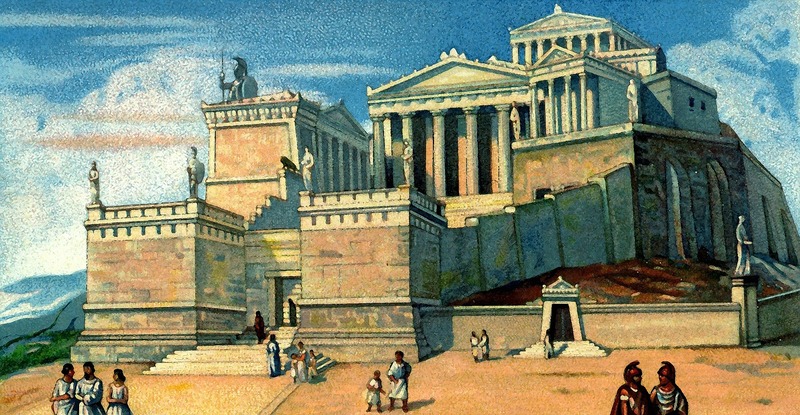 The Ancient Greek temples were coloured, but because of pollution they are now either grey or pitch white. 2. Diogenes was a well known thinker and philosopher. He lived in a wooden barrel because he wanted the people to see that he is not interested in money or wealth, but solely about ideas. 1. The Ancient Greeks discovered the fact that Earth is round long before Galileo Galilei. A scientist by the name Parmenides watched a moon eclipse and came to the conclusion that if the shadow of the moon reflected on the soil was round, then so must be the Earth. you should make your font bigger, I don’t like reading things that are super small. Also should add pictures. I like your information used it on a school project.